“The Big Easy” nickname means a lot more to many students because of their recent trip to the city of New Orleans. On Wednesday, March 21 students from the SPASH music department headed out for spring break early and took a 20 hour trip down to New Orleans on two coach buses. The buses left at 8:00 p.m. and arrived in New Orleans around 3:00 p.m. the next day. “New Orleans is unlike any other place. The sights and sounds do not compare to anywhere else,” Leif Akemann, percussionist, said. 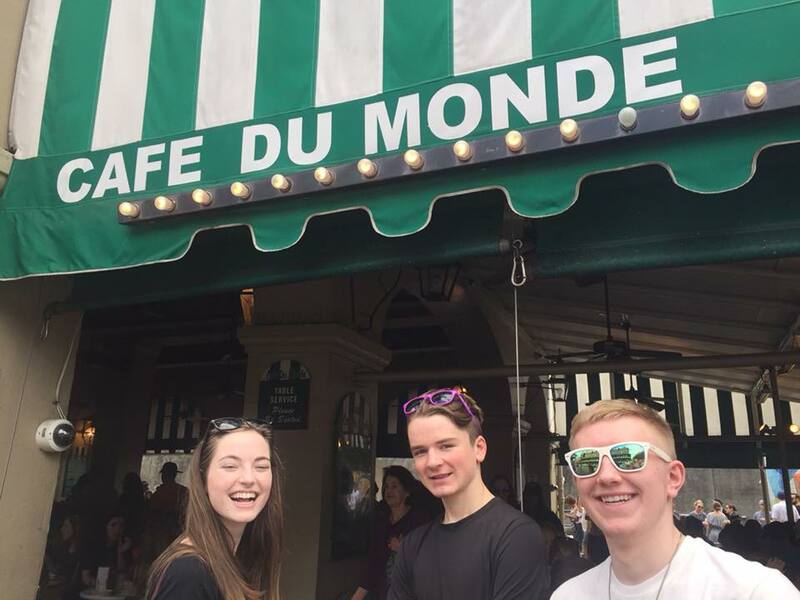 Shea Casey, Tom Felt, and Tanner Reed were among the music students who traveled to New Orleans over spring break. The students were able to get a full experience of the history of New Orleans, the jazz music, and the unique foods. Some highlights from the trip included exploring the French Quarter, trying some of the famous french donuts which are known as beignets, going on the “Creole Queen” boat cruise which included live jazz music, touring the Oak Alley Plantation, and going to Gulfport Beach. “I would say there were some unexpected twists and turns but all in all we saw a lot of interesting things and I hope everyone learned something and had a good time,” Brad Schmidt, band director, said. The last day, Monday, March 26, the students went to the National World War II Museum and ended the day with The Jean Lafitte Swamp Tour. “I liked holding the baby alligator. It peed on Katie Hoerter, which was funny,” Aubrey Borchardt said. Sadly, the buses began to head back for Wisconsin around 8:00 p.m. that day and the buses arrived at SPASH on Tuesday around 3:00 p.m.
Every other year the music department alters going to Florida and New Orleans. In the past, the trip would switch between New Orleans, Florida and Chicago but Chicago wasn’t a very popular trip. In order to actually go on one of the trips, the department has to have around 100 people signed up. The cost of the trip is around $1,000, but fundraising is available to students every year to cut some of the cost. A pizza sale, fruit sale, Copps and Kwik Trip cards, and Seroogy’s candy bars are all fundraisers that the music department participates in for extra cash on their trip. I’m not in band but I bet going there was super fun because that seems to be where it all started. School trips are always a lot of fun, I think I was able to get a sense of the energy of the trip by reading this! I love reading about trip experiences. They make me feel like I’m actually there. I’ve always wanted to visit New Orleans! The music, the food, and all the places you got to visit seem awesome! I can tell the vibe was good. You guys are so lucky. I went on this trip and it was so much fun. Its a great experience for students and even if your not in the music department I would recommend students going on trips through school. It was amazing and I made so many memories. This was such a cool story to read! The music department always has the best school trips. Sophomore year I went on the Florida trip to Walt Disney world and it was a blast. New Orleans is such a cool, old town filled with a lot of history. I really enjoyed reading this story, because I’ve always wanted to travel to New Orleans, so this story just gave me some ideas on what my trip might entail. I’m glad you, and everyone else had a lot of fun! Being in stage crew I’ve had the opportunity to hear multiple comments from the trip and it seemed like everyone who went had a blast. This article was great providing some very good information. I heard many great things about the trip from band students! I think it’s great that the music department offers this trip for people in band. It seems like they get to experience many new things and tour many interesting places. I think it’s really cool that kids are getting a chance to see the history of jazz and the area where it really rose to prominence, typically musical history is forgotten about but it seems that jazz won’t be forgotten quite yet.